When I picked up my elder daughter last Wednesday she told me she wanted a fairy garden because Jackie (her best friend) has a one. I had no idea what fairy garden was. I went to Pinterest for help later that night and thought that wasn't an easy project at all. I went through my old pins and saw some "Rock Village" images. Some of the painted rock houses don't look hard to make and they might be somehow connected to fairy garden. 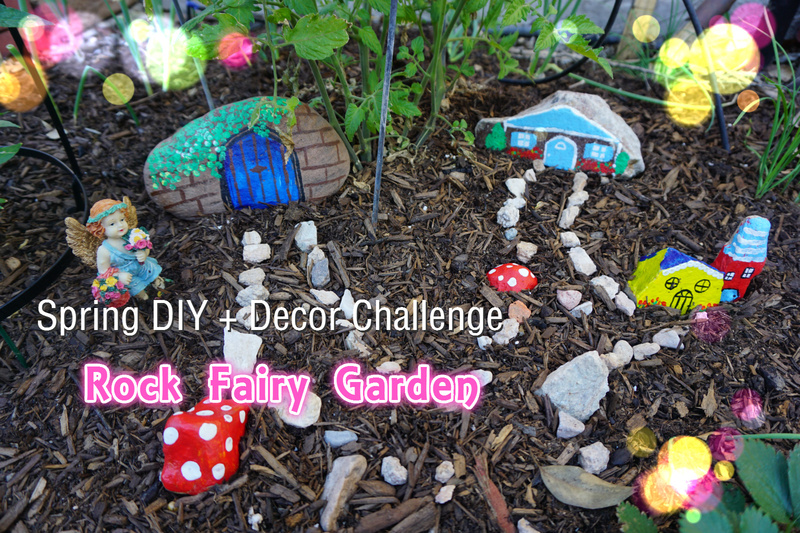 So another round of search and this time I tried "Rock Fairy Garden" and hey it exists. This a screen shot of the pins I found and collected. If you are interested, go head and check out my Pinterest Board Rock Village/Rock Fairy Garden for ideas. clear spray paint. THIS IS IMPORTANT. I forgot to mention this in my video. You need to seal and protect the paint by spraying the clear spray paint coating before putting the rocks in your garden. I put the rocks in our tiny plot in the front yard. It is my daughter's plot with one tomato plant, one pepper and one strawberry. I gathered small gravels from front yard to make the paths that connect the houses. I have no paint skills that's how you can tell this project is easy. Thank you for stopping by my post. Hope you give it a try. Share your spring DIY ideas with me by commenting below. I can't wait to check it out.